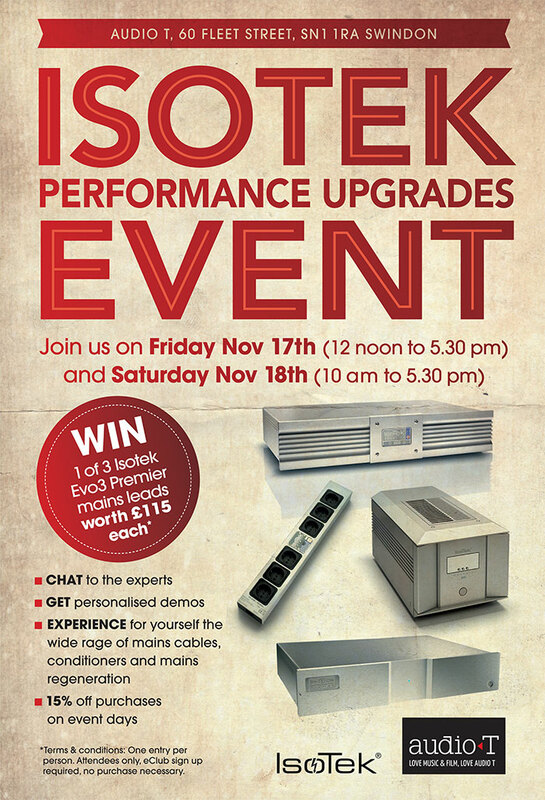 Visit us at Audio T Swindon on Friday the 17th (12pm - 5:30pm) and Saturday 18th (10am - 5:30pm) and come and hear for yourself how the benefits of mains conditioning in conjunction with IsoTek can give you more enjoyment from your music. The IsoTek Aquarius and Sigmas mains conditioners, plus the new Genesis One and Mosaic mains regeneration units. We will put the names of all attendees into a prize draw giving you the opportunity of winning 3 Isotek Evo3 Premier 1.5m with a value of each £115. The draw will be made at the end of the event day on Saturday. Exclusive offers available for attendees on the day. The quality of the mains electricity we feed into our Hi-Fi and Home Cinema systems has a profound effect on sound quality. Moreover, as the electronic devices we use at home continue to grow and the demand for electrical power increases, the quality of the electricity we feed our systems continues to degrade from radio frequency (RF) interference and mains noise. Visit us at Audio T Oxford on Friday 22nd September (1300 - 1730) and Saturday 23rd September (1000 - 1730) and come and hear for yourself the benefits of mains conditioning in conjunction with IsoTek. Your chance to win an IsoTek Premier Mains Cable worth £115 . Click here to view the range of IsoTek Hi-Fi mains products. We will put the names of all attendees over the two days into a prize draw giving you the opportunity of winning an IsoTek EVO3 Premier mains cable worth £115. The draw will be made at the end of the event day on Saturday. This is a great opportunity to hear how much you can improve the sound quality of your system and an affordable and worthwhile Hi-Fi upgrade. If you would like to book a personalised 1-2-1 demonstration please call us on 01865 765961. 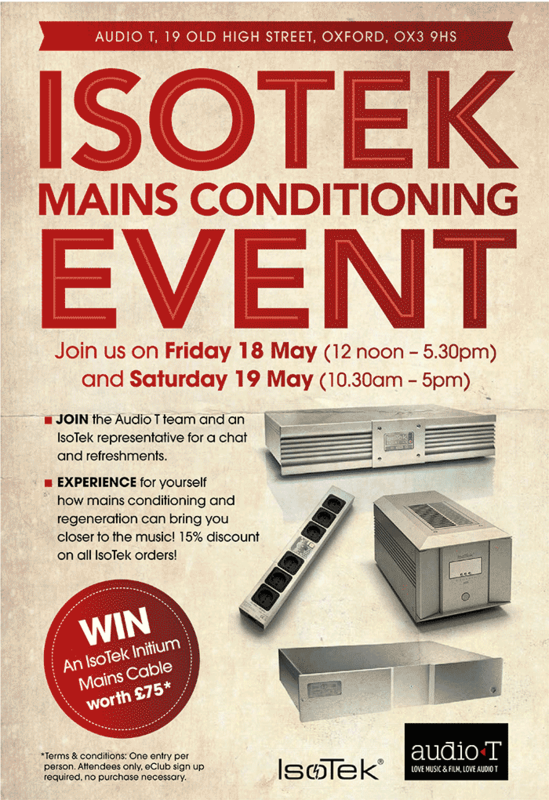 Visit us at Audio T Swindon on Friday 2nd June (12pm - 5:30pm) and Saturday 3rd June (10am - 5:30pm) and come and hear for yourself how the benefits of mains conditioning in conjunction with IsoTek can give you more enjoyment from your music. We will put the names of all attendees into a prize draw giving you the opportunity of winning an Isotek Polaris mains block and an Evo3 Initium mains cable with a combined value of £470. The draw will be made at the end of the event day on Saturday. Visit us at Audio T Oxford on Friday 4th November (1pm - 5:30pm) and Saturday 5th November (10am - 5:30pm) and come and hear for yourself the benefits of mains conditioning in conjunction with IsoTek. We will put the names of all attendees into a prize draw giving you the opportunity of winning an IsoTek EVO3 Premier mains cable worth £99.95. The draw will be made at the end of the event day on Saturday.